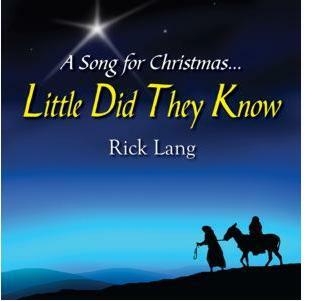 Nashville, TN -- Rural Rhythm Christian is proud to announce the new Christmas song, "Little Did They Know," written by acclaimed songwriter, Rick Lang. Arranged and produced by Stephen Mougin, "Little Did They Know" features the elegant vocals of Jana Mougin (lead vocalist from the popular Euro band Fragment) with Melonie Cannon and Stephen Mougin providing harmony vocals. They are joined by a great cast of musicians including: Randy Kohrs (Resonator Guitar); Stephen Mougin (Acoustic Guitars); Todd Parks (Bass); and Chris Brown (Drums).